Part of the Social City exhibition at UABB are two interactive installations by architect and computer programmer Mark van der Net. 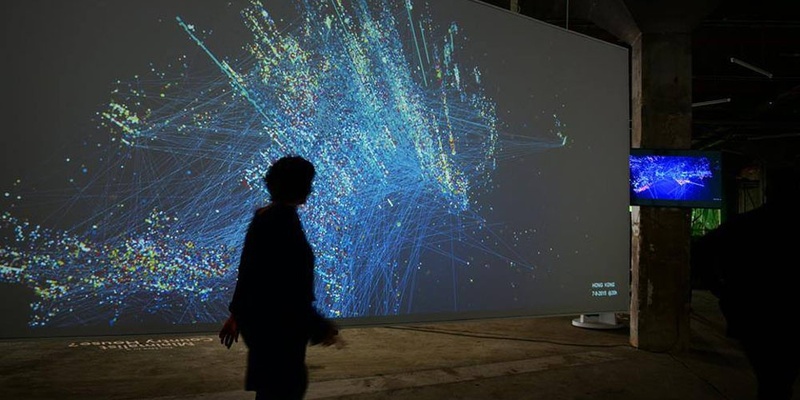 The installations describe the energy of two great neighbouring cities, Shenzhen and Hong Kong, captured by big data. What are we building by using social media? Mark van der Net explores how cities and information technology are intertwined. His goal is to create a new way of urbanism, which could facilitate a changing society. The interactive installations by Mark van der Net are directly tapping the social media, namely Weibo and Twitter in Shenzhen and Hong Kong. His work shows the things citizens communicate about and the places in the city at which they are while using social media. The virtual city grows with the activity of its citizens, creating a babel of individual messages, pictures, desires. Far from being a physical representation of the city, Babel illustrates the super-structure of social media and its urban dynamics. The installations build up over time: a warm colour represents daytime, while a blue one stands for the night time. Floating characters narrate the desires that netizens express through social media. Lines trace the way citizens move around and between Hong Kong and Shenzhen in their daily routine, illustrating the orientation of the two cities towards each other. A robust movement to Hong Kong by Shenzhen's citizens can be noticed. Shenzhen also shows a strong dichotomy between working (warm colour) and living (blue colour) areas. While in Hong Kong the two seem to merge and overlap more.